In 2003, devastating bushfires swept through Canberra. I’m sure I speak for most Canberrans when I say this was the most frightening, and challenging experience of my life. For a long time afterwards, Canberra was a place of charred black earth, withered trees and the smell of smoke and charcoal. It is hard to believe that from such devastation could come a place of such sweeping beauty, the new National Arboretum Canberra. Walter Burley Griffin, the designer of this city always envised an Aboretum in the planning of Canberra. However, by the time Griffin arrived in Australia in 1914 Thomas Charles Weston had been appointed as afforestation officer, and he and Griffin differed on tree species selection and planting priorities. Later, Griffin, faced with continual opposition from bureaucrats, resigned from his government position in December 1920. However, Arboreta, as part of Griffin’s design was gradually developed, beginning with the early plantings at Westbourne Woods and Weston Park. In the mid 1950s a substantial arboretum at the western end of the lake was established, and in 2001 was named Lindsay Pryor National Arboretum. However, the 2003 bushfires stripped the neighbouring hills of pine plantations and, the ACT government, took this opportunity to develop what has become the National Arboretum Canberra. This was a centenary gift to the city by the ACT government. 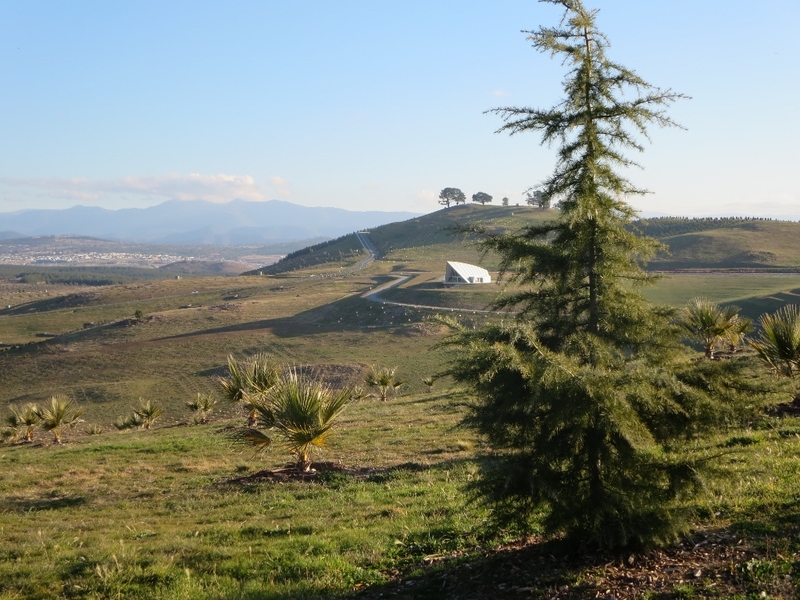 We now have an Arboretum from the lake to the hills, with urban forests, woodlands, open grassland and formal parks. More than 48 000 trees have been planted in the 100 forests on the 250 hectare site, many rare and endangered. The Arboretum was offically opened in 2013…10 years after the bushfires. Now we have a mosiac of fledgling forests, a venue for outdoor performances, an education and research centre..not to mention an amazing playground. In the words of Katy Gallagher, the chief minister officially opening the Arboretum.. This entry was posted in Canberra's Public Gardens and tagged arboretum, Canberra, endangered, forests, Marion Griffin, playgound, rare, recreation, research, trees, Walter Burley Griffin on March 21, 2015 by germac4.